The roof of a bus has been ripped off after it hit overhanging trees in central London. 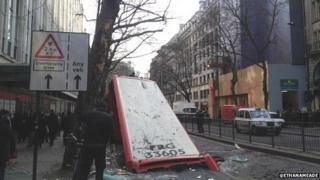 The number 91 bus hit the trees on Kingsway, near the London School of Economics (LSE) building, in Holborn. London Ambulance Service said two people were taken to hospital with facial injuries. Two others were treated for minor injuries. Kingsway was closed between the Great Queen Street and A4 Aldwych junctions, but has since re-opened. Media captionGary Squires, London Fire Brigade: "It's not something we deal with very often"
At the scene, London Fire Brigade station manager, Gary Squires, said: "Those involved were very lucky to escape serious injury." LSE student Ethan Meade said he turned around when he heard a crash. "I saw the roof fall down off the side of the bus and the glass shatter everywhere. "The passengers seemed to be sitting there pretty stunned, as you'd expect. Police seemed to handle it very well."